The doctor is out…of this world! Marvel's mystical "Doctor Strange," who originated in 1960s comics by writer Stan Lee and artist Steve Ditko, is a surrealistically spell-spinning sorcerer who employs magic instead of might to fend off his foes. Using mindblowingly trippy special effects and stunning CGI settings, director Scott Derrickson brings Strange to the big screen with all of the way-out weirdness that long-waiting fans could want. Benedict Cumberbatch portrays the genius-and-knows-it neurosurgeon with just the right amount of Marvel's trademark tongue-in-cheekiness. His initial Tony Stark-style arrogance gives way to humility and desperation after a car accident handicaps his hands. Medical science can't help him, but he hears there may be hope in the Himalayas. Instead of slowing the story to a drag during his time at a monastic retreat there (see "Batman Begins"), his studies have an appealingly Hogwarts-ish sense of wonder about them as Strange discovers how to manipulate "the source code that shapes reality." That's how bald head honcho The Ancient One (a wryly beatific Tilda Swinton) describes the unscientific rules that can be manipulated with enough practice, willpower and belief. Okay, this mainly involves making cool hand gestures in the air—but if it works, it works. The bad guys are former students Kaecilius (Mads Mikkelsen, rocking some terrifically overdone eye makeup) and his henchmen, who want to deliver our world to the dark dimension's dread Dormammu (think "really, really bad guy"). On Strange's side are the retreat's sternly humorless librarian Wong (great straight man Benedict Wong) and true-believer fellow disciple Mordo (the always enjoyable Chiwetel Ejiofor). Back in the more material world, trauma surgeon Rachel McAdams is Strange's former colleague and ex-girlfriend Christine Palmer, who refreshingly never finds herself consigned to "damsel in distress" duty. The dazzling visuals are so imaginative and clever that a single viewing of the movie may not be sufficient to take in all of the wonders on display. In addition to kaleidoscopic "Inception"-style building-bending and impossible M.C. Escher angles, one action scene takes place while the city around the protagonists "undestroys" itself in backward time. The equivalent of the "Beyond the Infinite" bit from "2001: A Space Odyssey" sends Strange on a thrill-ride innerspace free-fall. Spirits leave bodies as ghostly astral projections that duke it out unseen by unknowing mortals, "Sling Rings" teleport wearers wherever they want to go and Strange's oddly affectionate cloak of levitation has a life of its own. The screenplay (by Derrickson, Jon Spaihts and C. Robert Cargill) succeeds in differentiating "Doctor Strange" from Marvel's more conventional superheroes without getting overly intellectual about it. While it's hard not to wonder how the movie might have played with fewer Beyoncé gags and more genuinely terrifying existential worlds-beyond-worlds horror, the mass-appeal approach here is enough fun that it doesn't seem commercially cynical. One story flaw is that we should have seen something to verify Mordo's grave misgivings about a time-altering spell, considering how important his stance becomes later. In addition, "Doctor Strange" features a really weak Stan Lee cameo that completely breaks the flow of a fight scene. And the title of the book he's holding is almost impossible to read, which ruins the gag. Those are very minor complaints about a movie with so many must-see moments, however. 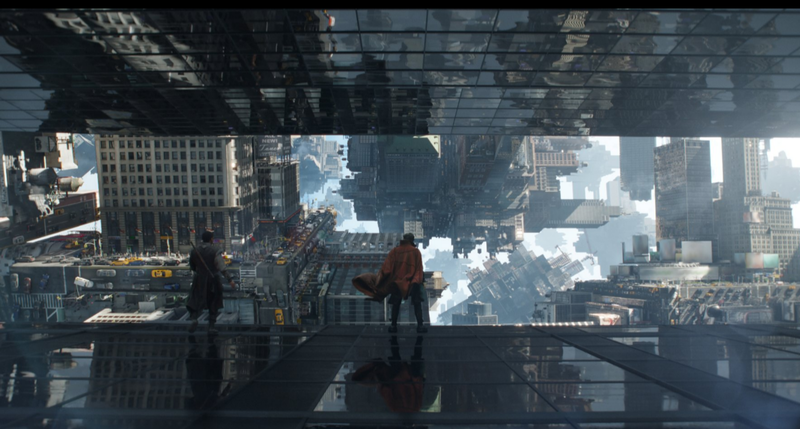 "Doctor Strange" is the 14th Marvel Studios movie (which doesn't include those featuring the X-Men, Fantastic Four and Spider-Man, among others, which were produced by other studios). It's also one of the best, hands down.